If you’ve been curious about the monthly block lotto thing I do (and updated in the sidebar monthly, even when this blog is woefully neglected) . . . but not curious enough to wade through the heavy, clunky interface and hundreds and hundreds of daily messages on the quilting forum, I may have good news for you. I’ve decided to move the Block Lotto to blogland and invite my friends and readers here to come play along. Everyone is welcome–if you are mildly curious, please come check it out. The rules are simple. 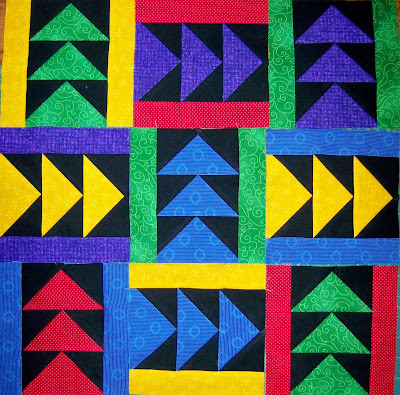 Make a block or as many as 9 to enter, following the rules for fabric and color. Your name is entered in the drawing at the end of the month for each block you make. For complete rules, follow the links in the sidebar for more complete info. In March, we’re making a variation of a Flying Geese block in jewel tones and black, based on an 1865 pieced silk quilt I saw at the Shelburne Museum in Vermont some years ago. Here are 24 blocks that have been made so far by Béatrice, Jill and Michelle. I’m hoping some of those who have appreciate my tips and patterns here will come play and some of my friends in Michigan that I’m missing will come play and all of the Block Lotto crowd will continue to come play . . . and that bringing the block lotto to blogland turns out to be the right thing to do.